For more information on the homebuying process, and helpful mortgage calculators, please visit Fannie Mae's homepath.com. 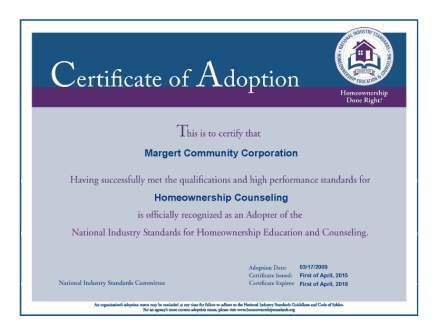 Margert is a HUD-approved housing counseling agency that provides assistance to persons who want to buy or already own a home, and who seek to be responsible buyers and owners. We provide individual counseling or group education/classes covering a variety of housing topics. Types of Assistance include: advice regarding readiness and preparation for homeownership; Federal Housing Administration (FHA) insured financing; housing selection and mobility; search assistance; fair housing, fair lending and predatory lending; budgeting and credit; loan product and feature comparison; purchase procedures and closing costs; money management (does not include debt management plan programs); selecting a real estate agent; and home inspection. This also may include guidance on: alternative sources of mortgage credit; down payment assistance; locating housing that provides universal design and visibility; how to apply for special programs available to potential homebuyers; how to purchase a home using the Section 8 Homeownership Voucher Program; and referrals to community services and regulatory agencies. Many New Yorkers want to purchase a home but have difficulty saving enough money to make the down payment. HPD’s HomeFirst Down Payment Assistance Program provides qualified homebuyers with up to $15,000 toward the down payment or closing costs on a 1-4 family home, a condominium, or a cooperative in one of the five boroughs of New York City. Types of Assistance include: post-purchase oriented group training sessions for multiple participants. Topics may include resolving or preventing mortgage delinquency and default, converting home equity into cash, seeking favorable mortgage loan terms, budgeting and financial management, real estate taxes and insurance and home maintenance. As with all our education programs, Margert also may offer individual counseling to complement these group sessions. Types of Assistance include: debt restructuring, re-certification for mortgage subsidy, reinstatement plans, loan forbearance, and managing household finances. This also includes helping clients affected by predatory lending, foreclosure prevention strategies, explaining the foreclosure process, and assisting clients with locating alternative housing or pursuing loss mitigation strategies. 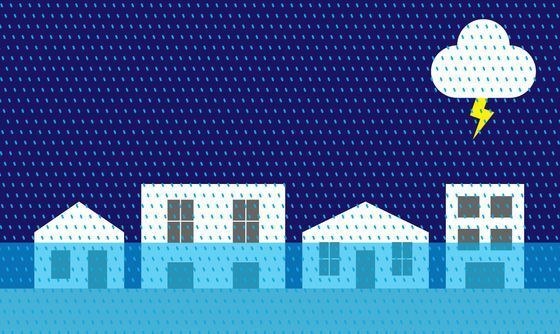 Check out a new interactive guide that lets homeowners navigate flood insurance options and learn about New York’s flood zones. Types of Assistance include: this includes information on finding favorable mortgage loan terms, personal money management, and relations with lenders. It also includes help in converting home equity into cash (home equity lines of credit, cash-out re-fis, etc. ).